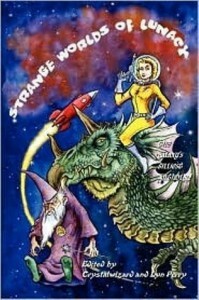 Strange Worlds of Lunacy - Lyndon Perry, Crystalwizard, James K. Bowers, Steve Doyle, Charles Allen Gramlich, Alex Moisi, Catherine J. Gardner, Richard Svensson, Christopher Heath, Colin P Davies, D. Richard Pearce, Dal Jeanis, Dana Davis, Danny Birt, Ed McKeown, Francis Wesley Alexander, Gustavo - review - Writing and Reading and Editing, O My! 1)The editing problems--font size changes mid-page for no reason, and there are just a few more typos and technical errors than I'm willing to forgive. 2)A couple of the stories seem to have no particular point, or perhaps I'm simply missing the joke. However, the puns I did understand are marvelous; the illustrations (by Richard Svensson) are well-drawn; the introduction and closing pages are as silly as the cover promises, and I definitely found a few names in this anthology (Danny Birt, Dan Devine, Gustavo Bondoni, Robert J. Santa) that I'll be watching for in the future.